After attending a weekly village protest in Bil’in, I was pretty happy to have the chance to go to and be an unmarked medic for another one in Nabi Saleh. Nabi Saleh is tiny, with only 500-600 people. It’s a pretty Fatah-loyal village that sometimes carries a Fatah flag out to protests. It joined the weekly village protests – what have sometimes been called the “white intifada” – after the nearby Israeli settlement of Halamish, which has a long history of staging attacks on Nabi Saleh, seized the little village’s spring to use as a spa. 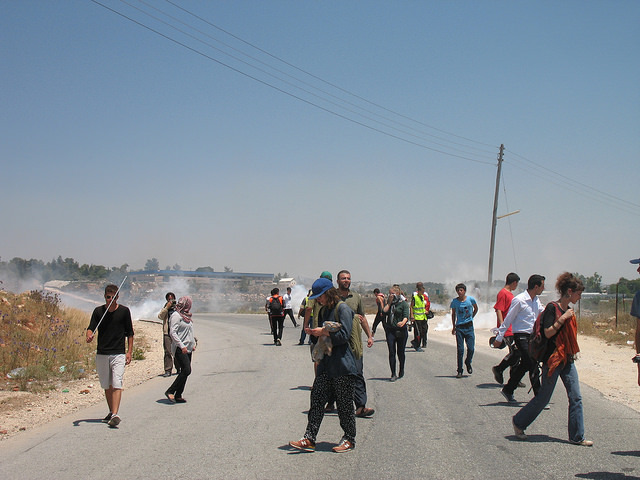 Unlike in Bil’in, where the marches move toward and then parallel with the Separation Wall, these marches usually proceed down the main road into and out of the village, toward a point near the spring and the settlement where the IDF will already be waiting. 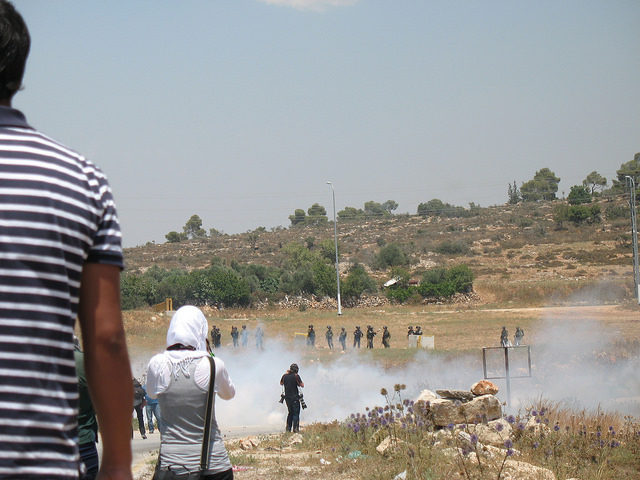 The Nabi Saleh demonstrations were described to me as often being “intense.” Two demonstrators have been killed since 2009 – Mustafa Tamimi, shot in the face with a tear gas canister at close range in 2011, and Rushdi Tamimi, shot twice with live fire in 2012. Protest organizer Bassem Tamimi has been arrested a dozen times, and was once imprisoned without trial for three years. Many other demonstrators have been injured. I was told by a demonstrator that night raids against the village used to be a common response to the village protests, but had become less common as more international visitors had participated in homestays in the village. I went to the protest with K, a Palestinian Red Crescent medic whose contact information I got from an activist that I met during our regular delegation activities, and T, an Israeli anarchist (as well as a few internationals that T was helping to wrangle). T and I had a great conversation in our Service (Palestinian shared taxi) about “manarchists,” and I taught her the word “brocialist” as its socialist counterpart, which she appreciated. She talked about obnoxious internationals who think it’s their place to decide whether to escalate a Palestinian protest, and how she’d had to tell off an American who started throwing rocks when no Palestinians had done so at that protest, telling him that if he wanted to throw rocks he could throw them in his own country. Bad “allies” are a problem all around the world, apparently. 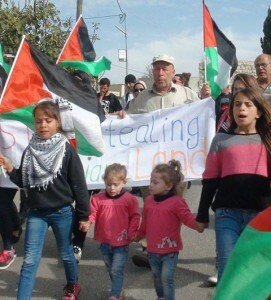 Nabi Saleh girls, including the teeny blond twins, out front at a November protest. Photo by Bilal Tamimi. twins, perhaps four or five years old, in the picture at left (those girls were at the demonstration with me, but that picture was taken months later, in November). With the village being so small, nearly all residents are related by blood or marriage, as indicated by the high frequency of a few surnames, like Tamimi. For some historical reason or other, many residents have very light complexions by Palestinian standards. There are a lot of light-skinned Nabi Saleh villagers with blond, red, or light brown hair, blue or green eyes. I cynically thought to myself that this village would be an ideal site for outreach to and humanizing of Palestinians in the US – look at the cute little white-appearing blond girls being attacked by soldiers! As we started the march, perhaps 100 of us, the identical twin preschoolers trotting determinedly a few feet away from me, I mentioned to K and T how impressed I was that these teeny little kids kept coming out to these protests, which had to be awfully scary for them, week after week, looking calm and unafraid. T replied that many of the young kids, however tough they look at the protests, have a lot of psychological problems, like nightmares and bed-wetting, as a result of not only the violence toward them at the protests, but the raids and other incursions into the village. As we walked down the road toward the IDF’s staging area, teenagers put a line of rocks in the road to prevent military jeeps from crossing that line into residential areas. In the staging area, we could see a line of well-armed soldiers and a few armored jeeps and MRAP-type vehicles. Facing off with soldiers through a cloud of tear gas. One of my favorite photos that I took. closer to us for good measure. It was very dry, maybe even drier than usual, and within a few minutes the canisters had set several brush fires. I went to see if I could throw some debris on one and stop it burning, but discovered the hard way that the fire smoke was full of tear gas, and decided that unless it became a real danger to any demonstrators or their property I would let it burn itself out. That road is one of the main ones not only to get to Nabi Saleh, but several other small villages in the area, and anyone driving through the area would be likely to take it. Several Service taxis passed through the protest, slowing to avoid putting any marchers at risk, and the drivers and their passengers shouted and waved their approval. It must have been irritating for them, in multiple senses, to be tear gassed and maybe shot at with rubber bullets while going about their ordinary business and not protesting at all, but they were fully supportive. Suddenly, one of the MRAPs started charging down the road toward the demonstrators. I wheeled and took off sprinting, convinced that we were about to be either run down or shot with live fire, yelling “Tank, tank!” (yes, I know it’s not really a tank, I didn’t think a bunch of non-native speakers would understand “MRAP”), which was entirely superfluous because at least ten other people were yelling similar things. Except for a few people who decided that staying as still as possible would make them look more nonthreatening, everyone else started sprinting like a bat out of hell at the same time as I did too. As we sprinted, yelling, back up the road, someone, possibly the soldiers in the MRAP, started firing canisters directly at the fleeing crowd. “I can’t see the canisters!” I yelped at nobody in particular, throwing my arms over the back of my head (news flash to past self: neither could anyone else since we were all running in the same direction). One brave guy, who had gotten out in front of the crowd, stopped and turned to watch the incoming canisters and yell to us which direction to move in to avoid being hit. The road is concrete, not a dirt road, and the “gas rocket” canisters, striking it at high velocity, bounced and skittered through the fleeing crowd for several seconds after landing. Not for the first time, I cursed myself for having brought only open-toed shoes to Palestine as a speeding 350+ degree canister bounced irregularly around by my feet. At least the canisters weren’t bullets. Catching our breath after running away from the IDF vehicle. line to block IDF vehicles off from residential areas? – and then stopped, trying to catch our breath. The MRAP had stopped probably 100 or 150 feet before the line, and a couple of soldiers had gotten out. As we hyperventilated, they stayed there for several seconds, then got back in the vehicle and went back to the staging area. Some of the other demonstrators speculated that they’d been trying to draw stone-throwing so that they would have an excuse to escalate. Between the dryness and the sprint, I was at the point where I actually couldn’t speak or swallow because my tongue and mouth were too dry, so despite the warnings about drinking to soon after inhaling local tear gas, I took a swig of water, which was find and let me speak again. We went back over the rock line and back to protesting. As the demonstration wound down, I noticed a teenage boy who was limping quite badly. He didn’t speak English, so I asked the boy next to him if he was all right. I learned that he had been one of the young men on the hillside and had fallen several feet off a ledge while dodging a flying canister. He didn’t want me touching him – many Palestinians have cultural taboos around being touched by strangers of a different gender – so I got K and told him what had happened. K talked to them, and then physically supported the injured boy, while I walked next to him on his other side without touching him in case he needed more help. He declined any other treatment. We all walked to a gas station/convenience store in the main area of the village. Remembering how after the Bil’in protest my lungs had felt sort of bad for the rest of the day, I bought a one-liter bottle of Coke, because caffeine is a bronchodilator (i.e. it widens passages in the lungs and makes breathing easier). Which I had finished well before I got back to Abu Dis, where I was staying at the time, that evening. I was thirsty. Since I was there, the Nabi Saleh villagers have continued their protests. In late November, three, including two teen boys and a 38 year-old woman, were shot with live .22-caliber fire. According to the account at that link, the woman was shot in front of her children and then left in the road by soldiers who did not provide first aid. 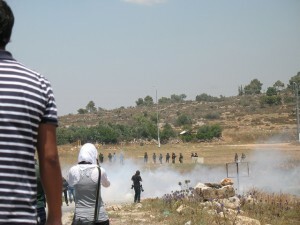 You can read more about Nabi Saleh’s demonstrations at the Nabi Saleh Solidarity blog.